The walk we took to school this morning was an easy three-minute journey across the driveway at our farm in Tennessee. But in another sense, it was a very difficult one that started in Indiana two-and-a-half years before. In early March of 2016, the day my beautiful wife Joey took her last breath after a long and public battle with cancer, we were in my truck driving back home to Tennessee. We had spent the past five months in Joey’s hometown of Alexandria, Indiana, living out her last days surrounded by family. And as I drove, I couldn’t help but think of the difficult journey that lay ahead. Not just the 300-plus miles, but the many decisions I would have to make in the coming months and years to somehow move forward in life, without Joey. Especially the ones for our 2-year old daughter Indiana who was sleeping soundly in her car seat just behind me. Rory Feek, his late wife, Joey, and Indy, in the spring of 2015. Joey’s plan had always been to home-school Indy. To raise and teach her at home. Not just how to read and write, but more importantly, to be part of molding her character and faith and help her become all that she can be, especially since she was diagnosed with Down syndrome at birth. But now, it was clear that we would have to come up with a different plan. As we drove home to Tennessee that night, I had no plan, really. Well, not much of one. No plan except to believe that God would show us the way. Joey was always better at things like this than I was. More grounded and more practical and somehow able to always know what the best right thing to do was, even in the most difficult of circumstances. I would have to take it a day, and a decision, at a time. In the coming weeks I would enroll Indiana in High Hopes, a wonderful integrated pre-school a half-hour or so from our farm and she would thrive there for the next two years. Learning to walk, though later than other kiddos her age, and also to talk incredibly well, in spite of the challenges she had. And then knowing that she would soon age out of High Hopes, an idea began to emerge to have the best of both worlds: Indy having the chance to be part of an amazing school, and being at home, at the same time. Indy and her friends and teachers on the first day of school. And now here we are walking across our driveway to a beautiful one-room schoolhouse built at our farm, a stone's throw away from the little family cemetery where Joey’s wooden cross stands. It’s Indiana’s and a dozen other little ones' first day of school at Hardison Mill School, named for the one-room schoolhouse that had served the children here in our community a century or more before. It was a day I could have never imagined when Joey passed away. Though I am a big dreamer and have been blessed to be part of many incredible stories that have unfolded through the years, this was beyond even my wildest dreams. It partly came to be because of Indy and the need to find the best, right choice for school for her, but even more so because of her Mama's passing. In the days and weeks that followed Joey’s funeral, we received hundreds, if not thousands of cards and letters in the mail from people expressing their sympathy for our family and all we’d been through. They told of how they had prayed for us and how they are praying still. And in many of those envelopes there were $5 bills. And 10s and 20s, and change and checks of all sizes. When we spread their outpouring of love all across the kitchen table, it added up to nearly $100,000. It was beyond humbling. After Joey's passing, money and cards poured in through the mail. 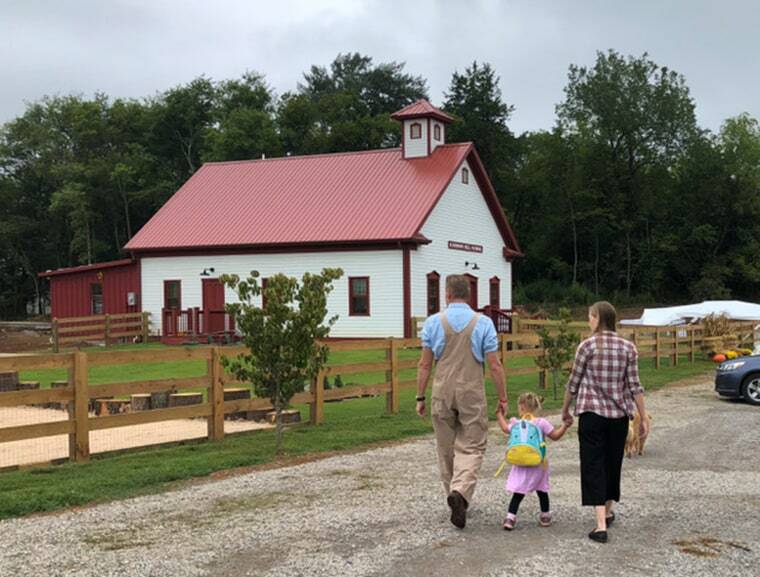 Last fall, when the idea came to build a schoolhouse at home started to become a reality, our community gathered with us for an old-fashioned barn-raising. But instead of a barn, we raised the walls and trusses of a one-room schoolhouse. One that looks like it could’ve been built 150 years ago. And it was the money from those cards and letters that we used to build it. When it was completed, the total cost of the schoolhouse was exactly what had been given to us, almost to the dollar. Indy at the end of her first day of school at the new one-room schoolhouse. And so today was a special day for our family, a day when something beyond heartbreaking became something beyond beautiful. I stayed for a long time this morning and watched Indiana play with her new friends on their first day of school. And as I watched, I thought of how blessed we are, and how wonderful it is to be part of using our blessing to bless others. And I couldn’t help but think of what the future might hold, of what this school will become in a year, or in 10 years. And of what Indy will learn here and how this will change who she is, and who we all are.